Specifically designed with the workplace in mind. 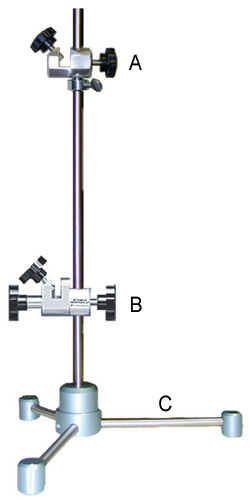 All models are State of The Art in Laboratory Stirrers. 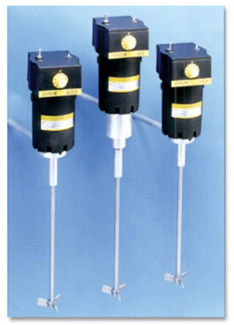 These variable speed stirrers are electronically controlled and built to handle viscosities ranging from light watery solution to high viscosity fluid, depending on the model. Totally enclosed non-ventilated motor, keeps corrosive fumes and dust out for a long and trouble free service life. Permanent magnet D.C. motor provides maximum constant torque through entire speed range. An on/off switch for quick stopping if necessary. Overload protection - a manually resetable circuit breaker for total safety. Eye level heavy cast aluminum control box integrated with motor keeps workplace uncluttered of unnecessary gadgetry and away from corrosive spills or splashes and allows for efficient and safe use of stirrer. Eye level control knob electronically regulates speed of application required. Each model comes complete as shown including 9/16 dia. x 10" long aluminum support rod and 6 ft three wire cord with grounded plug. 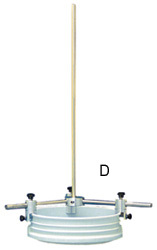 A low cost and light duty stirrer ideal for stirring light to medium-light viscosity fluids. This direct drive stirrer delivers 16.8 in-ozs or 1.05 in-lbs of constant torque throughout its speed range of 0 to 6000 RPM. A general purpose stirrer and will handle a wide range of applications. It is specially designed to handle the more viscous materials. This direct-drive stirrer delivers 39 in-ozs or 2.43 in-lbs of constant torque throughout its speed range of 0 to 2000 RPM. Specially designed for heavy duty viscous materials, the Arrow 850 provides speed with power. This high torque gearhead stirrer delivers 117.6 in-oz or 7.35 in-lbs of torque and will maintain constant speed regardless of viscosity changes as mixing progresses. Speed range from 0 to 1000 RPM. Its slim design is ideal for use in 3 neck flasks. * Also see Arrow Model 350 Below. The Forward-Reverse rotation of the Agitator provides powerful mixing-action and eliminates Cavitation. The instant-Forward and instant-Reverse Rotation of the Agitator is Electronically controlled and has a variable reversing time cycle of 2 sec. min., 20 sec. max.. This feature, along with the variable speed control of the Agitator, allows you to create the most dynamic and complete mixing action with no formation of air bubbles. The Agitator can also be used as a regular stirrer by simply selecting the standard mode. The Agitator has all the features of the Electric Laboratory Stirrers and will handle a wide range of applications. It is direct driven and delivers 39.8 in-ozs or 2.43 in-lbs of constant torque throughout its speed range of 0 to 1750 rpm. The shaft and propeller are 316 stainless steel (shaft measures 12"L x 3/8" dia and a 2-1/2" dia propeller). Air Version Explosion-Proof Models Available. Ideal for mixing all types of solvents, lacquers and volatile chemicals without the possibility of spark ignition. Six explosion proof models are available for your high speed, general purpose and high torque mixing applications. See specifications that follow. All motors accept an air input line pressure from 35 to 80 psi and a needle valve allows you to vary mixing speed. Built in muffler ensures quiet operation. Mixers include a 4 ft. length of air hose with double fittings for connection to your air supply. NOTE: We recommend using a filter/regulator in your air supply line. Type “A” - Ideal for stirring all types of solvents, lacquers, oils, synthetics and chemicals. The stirrer can be used in ambient temperatures up to 250° F (120° C). Type “G” - Specially designed for use with the more viscous materials, providing speed with power. Type "G-HD" - Same as type "G" but has steel internal gears reduction unit for continuous agitation of highly viscous materials. Type “GG” - Specifically designed for heavy duty viscous material where low rpm and constant speed is required. Type “A-5” - The same as Type “A”, but is recommended for larger batches. Type “G-5” - Heavy duty gear reduction unit designed to handle more demanding applications, like continuous agitation of highly viscous materials. Used for most applications - Very versatile clamp. Designed with large knobs for powerful gripping plus an adjustable stop for speed and safety in set up and operating. The Universal Swivel Clamp lets you set the stirrer to any compound angle for best stirring action. One knob - Lets you lower or raise the stirrer. One knob - Locks stirrer on support rod. One knob - Controls swivel setting. Made of a steel base and the legs have rubber pads to cut vibration. The support rod is made of 304 stainless steel. The overall height is 29" and it comes in two models. Named because of its ability to clamp on the edge of 5 gal. pails, small drums, square or rectangular tanks. Will fit securely on vessels with rims up to 5/8" wide. Adjustable legs & swivel clamp adjust to give maximum holding power. Constructed of lightweight aluminum base & has a 5/8"dia. x 24"h 304 stainless steel support rod, allowing you to lower & raise stirrer to your needs. Provides safe & secure mounting system on any vessels & it comes in 2 models. Capacity from 1/16" to 3/8" dia. (1.5 mm to 10 mm). Comes in 3 adapter sizes. Capacity from 1/16" to 3/8" dia. (1.5 mm to 10 mm). Comes in 3 adapter sizes. KLC Series Capacity from 1/16" to 1/2" dia.